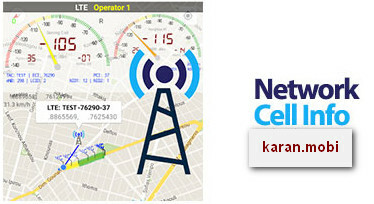 Network Cell Info provides cell locations in the map and separate network signal strength gauges for the serving (registered) cell and the neighbor cell. It covers all cellular networks including LTE, HSPA+, HSPA, WCDMA, EDGE, GSM, CDMA, EVDO. – Please check here for current issues, especially for Samsung devices: http://goo.gl/Hy0dx5 . Please feel free to email us any issue. – It is recommended to set the GPS mode to “high accuracy” in the location settings of your device. – We don’t have own database for cell locations. We use currently the MLS database (please see below) which returns not the actual cell tower location, but roughly an indication of the cell locations. – The LTE, UMTS and GSM cell locations we get from Mozilla Location Service (MLS) – http://ift.tt/1EycphV – and show in the map as antennas, are not real tower locations, but roughly an indication of the cell locations (if no cell location is shown in the map, it means MLS has no data for your cell). – MLS doesn’t support CDMA any more. – If the app doesn’t return cell locations, or if you want to contribute/update the cell locations, you may use Mozilla Stumbler app ( https://goo.gl/sysSNQ ) to update the MLS database in your area. – The measurements you make in the MAP tab, can be saved locally in your device (please see FAQ inside the app for details) in one of the following 4 formats: CMWF v.1 (our own), OpenCellID csv, CLF v.3 and our legacy one. – There is no dual SIM support yet.